e-Ophthalmology is the use of information and telecommunications technologies to provide or support a group of activities related to ophthalmic care. Chronic glaucoma is an ocular disease characterized by optic neuropathy that leads to progressive loss of the visual fields and often is associated with elevated intraocular pressure levels. Glaucoma is an important public health problem because it is one of the main causes of blindness worldwide and generates an important demand for ophthalmologic consultations. The aim of this chapter is to discuss the application e-Ophthalmology-based models in the diagnosis and follow-up of chronic glaucoma. The authors describe the current status of the use of e-Ophthalmology-based models in the screening and follow-up of chronic glaucoma, the main advantages of these models, the technologic requirements for their implementation, and future trends in this field. e-Health can be defined as the use of Information and Communication Technologies (ICTs) to provide or support a group of health care-related activities. The same concept applied to ophthalmic care is referred to as e-Ophthalmology (Kumar & Yogesan 2005), which can be used to diagnose, administer treatments or preventive health care activities, screen for diseases, educate, or investigate. e-Ophthalmology makes medical practice independent of time and space, allows specialists to organize their work time more efficiently, and improves the patient access to ophthalmic care. e-Ophthalmology can be substituted for direct patient/doctor visits during follow-up of some chronic ocular diseases, allowing specialists to examine results and images using different remote diagnostic devices. 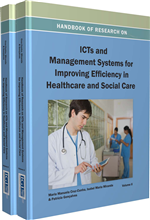 Implementation of e-Health systems with a broader use of ICTs may be a very useful resource to face the complexities of future health care. The current status of the use of e-Ophthalmology-based models in screening and follow-up of chronic glaucoma, the technologic requirements needed to establish the models, their advantages, and the future possibilities in this field are described in this chapter. This chapter also briefly addresses the main clinical characteristics of chronic glaucoma and the diagnostic tests used. Second, a literature review of reported e-Ophthalmology-based models for screening and following chronic glaucoma was undertaken and the current status of e-Ophthalmology in health care is evaluated. Visual Field: This is the space that the eye captures when looking at a fixed point. To carry out an examination of the visual field, the patient sits before a concave screen and gazes at a centrally placed object. A computer program emits small lights of variable intensity at different sites of the screen and the patient presses a button as soon as light is perceived. The patient responses are compared to a control group of subjects of equivalent age to determine the presence of visual field defects. Hospital Information System (HIS): This is a centralized system that digitally manages the administrative, financial, and clinical data of a hospital. Picture Archiving and Communication Systems (PACS): This system manages storage, access, distribution, interpretation, and representation of image files. Normally, PACS work closely with the DICOM format. Digital Imaging and Communication in Medicine (DICOM): This is the standard recognized worldwide for the exchange and management of medical images between equipment from different manufacturers. Optic Disc: This is the point at which the optic nerve enters the eye passing through the sclerotic membrane, the choroid layer, and finally the retina. The optic disc, a red disc found in the posterior pole, has a mean diameter between 2 x 1.5 mm. There are no photoreceptors in the optic disc, and for this reason it is also known as the blind spot. Optical Coherence Tomography (OCT): This is a non-invasive technique used to image intraocular tissues by measuring the echo time delay and intensity of back-reflected light. The resulting image provides high-resolution, cross-sectional representation of structures with near histologic detail. It also allows for the measurement of the retinal thickness. Intraocular Pressure (IOP): This is the fluid pressure inside the eye. Tonometry is the method eye care professionals use to determine this. IOP is an important aspect in the evaluation of patients at risk from glaucoma. Chronic Glaucoma: This is a chronic optic neuropathy in adults in whom IOP and other currently unknown factors contribute to damage and in which there is a characteristic acquired atrophy of the optic nerve and loss of retinal ganglion cells and axons leading to characteristic visual field defects.